Easy Duplicate Finder promises to clean your disk of duplicate files with ease. It does what it says, but you can find other programs that will perform the same task for free, rather than for the $30 you'll have to pay to use this program beyond its limited demo capabilities. Easy Duplicate Finder finds duplicate files, but you'll have to pay $30 to make full use of it. It did its work quickly, scanning my test PC's hard disk--which had more than 17,500 files--in less than ten minutes. And Easy Duplicate Finder appears to do a very good job of finding duplicates; it found 520 files that it said were duplicates, totaling more than 290 MB or hard disk space. And it doesn't just search for duplicate file names, and looks at the actual contents of the files themselves. Be careful, though, when you use Easy Duplicate Finder, because its operations can be confusing once it finds duplicate files. After it does its work, rather than letting you view each file, it tell you how many duplicates it's found, then asks if you want to delete them all. At first it doesn't appear to give you the option to examine individual files, which would be a problem, as you might decide to delete some while keeping others. However, if you click the small X to close the screen, you'll come to another screen that shows you exactly what duplicates it's found, lets you examine each, and then delete only the ones you want. 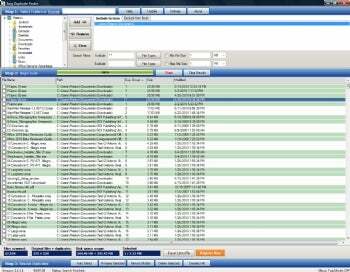 Easy Duplicate Finder offers you a great many options over searching and deleting, including selecting individual folders, excluding certain file types. Easy Duplicate Finder works quickly and well. Given its excellent (and similarly named) competitor Easy Duplicate File Finder is free, though, there's really no contest. There's not much reason to pay $30, when you can get a good free program to do the same thing. Note: The demo version lets you delete only 10 duplicate file groups. You'll need to pay $30 if you want to make full use of the program. Also, note that when you install it, it will install the GigaSize toolbar, so uncheck that option during installation if you don't want the toolbar installed.